In 1964, an agile, left-footed wingman from Maffra named Jim Pleydell made a strong impression in his first year of VFL football with the Navy Blues. Given the nickname “Sam” by his team-mates, and wearing guernsey number 33, Jim played his first senior match against St Kilda at the Junction Oval in round 6 of that season. He showed glimpses of real talent in a disastrous 48-point loss to the Saints, and thereafter, held his place in the team throughout the remainder of the year. 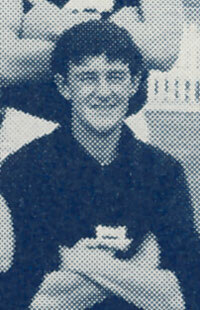 At season’s end he won Carlton's Best First Year Player Award, and his future looked assured. However, just two games into his second season, Pleydell copped an errant forearm to the face from a Geelong opponent; a blow that broke his jaw and shook his confidence for months. Although he eventually returned to senior football late in the year to play another five games, by 1966 his position in the team had been largely usurped by the likes of Garry Crane, Bryan Quirk, and Cliff Stewart. The Blues’ match committee gave Jim other opportunities at half forward in 1966-67, but it was soon obvious that he was first and foremost a winger, and therefore surplus to requirements. So it was that after 37 matches over four seasons, Pleydell departed Princes Park and joined Essendon. He spent all of 1968 at Windy Hill without breaking into the Bombers’ senior side, and retired from VFL football at the end of that year. By 1970, Jim was in Tasmania, where he won consecutive Best and Fairests for Cooee in the North Western Football Union in 1971-72. Contributors to this page: Grisdesa , Jarusa , PatsFitztrick , Bombasheldon , molsey , tmd1 , true_blue24 , p(12)terg , kkk and admin . Page last modified on Friday 27 of July, 2018 00:29:52 AEST by Grisdesa. 1973 Rd 6 - Big Nick plays 300th game.